Currently I am using newmoon xp32-20171006. I made a portable launcher with JauntePE, compressed all the binaries with UPX, installed NoScript, dictionary, and uBlock origin addons. Now I've got a portable browser under 60MB that runs great ! Nice, I'm gonna try this out when I get home tonight, see how it compares to Firefox 52/SM 2.48. Would you know the comparative Gecko version of new Moon? Pale Moon forks Gecko 24 and adds/backports new features on top. I better download this! Pardon my ignorance, but is it technologically better than Firefox in some way? Since the ESR is set to be the last supported version for XP, it seems like this could be the best option going forward, and I suppose that alone makes it better. Also, where did you get that theme, and what is it called? It looks like FOXSCAPE (which was my favorite theme back in the Firefox 10.x-19.x days), but FOXSCAPE hasn't been compatible with anything since FF28. EDIT: Never mind. Found it! It's called MOONSCAPE! OK, I have it all up and running now. I like it! It totally blows modern Firefox away, yet manages to still render modern sites properly. 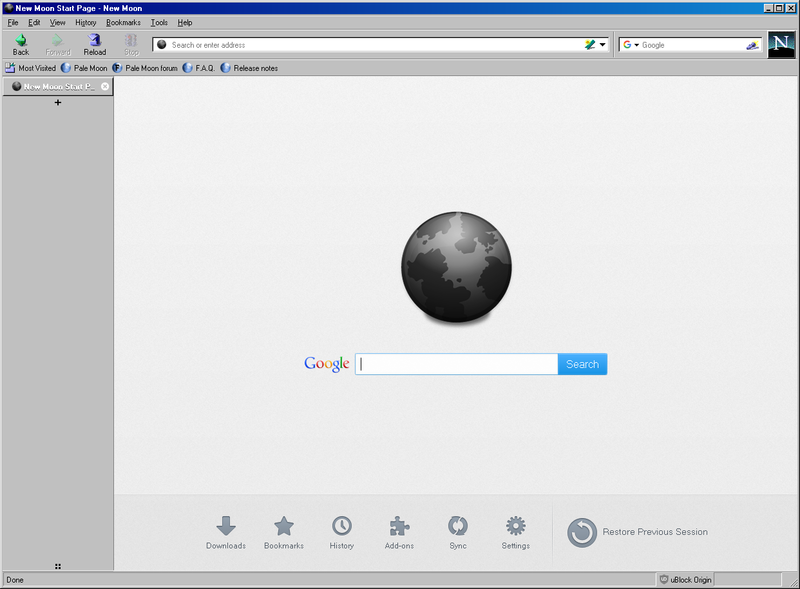 I think I have a new favorite browser for XP (and anything else this will run on)! If it's about marketing and you want it to stick and lure users. Think about the user suggesting it to another user. I'm using FireFox probably sounds better than I'm using Pale Moon, New Moon, or Pale Mimas. You want to lure more users and have people proud and interested in bringing the name of their browser up and the XP crowd isn't as dominant today. Trust me it'll beat "Pale Mimas". Don't believe me do a poll vote between these two names. Now if you could tap into the > 3.2GB memory region of XP for Browser memory usage to have more tabs open it'll be a big hit. Most browsers including FireFox seems to crash or slow down around 1.5GB to 2.0GB memory consumption. Since your from H.K. you're probably familiar with the Moon Festival. You'll probably appreciate the extra hits for Black Moon. and it will use "profile" folder for its profile data. Or even better, could you create a portablemoon.exe, which uses profile as it's default folder?! I'd like to have separated download for this instead. Extract all contents (both EXE and TXT) in the place where palemoon.exe lives. Run portable-loader.exe for portable mode.